Stunning four double bedroom three bathroom two storey semi-detached house (1,757 sq ft.) located in the heart of Queens Park. The ground floor boasts a luxury kitchen/diner with all appliances including Miele dishwasher and Smeg fridge/freezer and leading to a private south east facing rear garden, wonderfully bright reception room with working fireplace, double bedroom (also leading to garden) and shower room with wc. 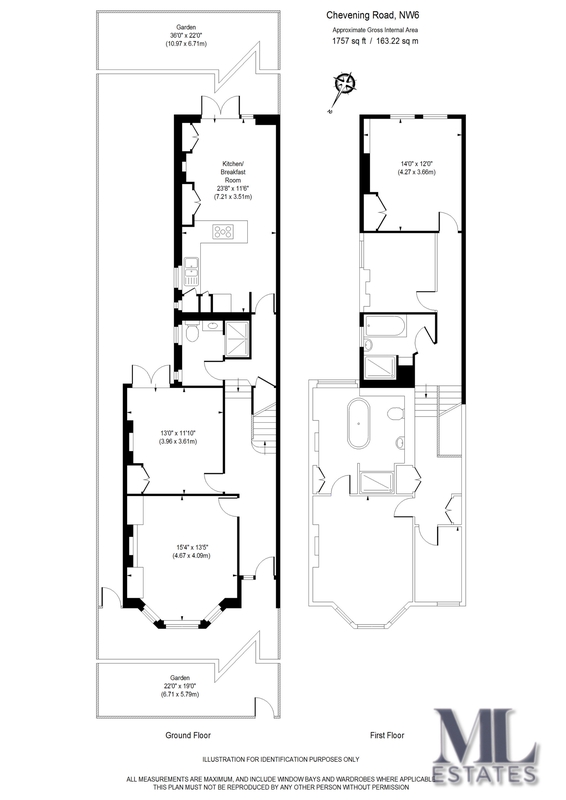 To the first floor are three further double bedrooms (ensuite to master) and a family bathroom with shower cubicle. Further benefits include front garden, high ceilings and soft furnishings. Available from 10th July. Chevening Road is moments from the award winning Queens Park and the wealth of nearby boutiques, cafes, restaurants, gastro pubs and its very own local cinema served by Salusbury Road. Transport links include Kensal Rise (Overground line) and Queens Park (Bakerloo line) stations as well as mulltiple bus routes. INVENTORY £240 incl VAT.